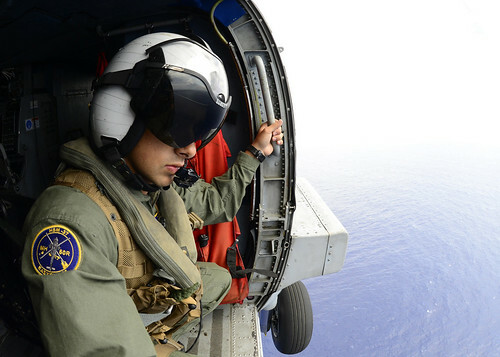 SAN DIEGO - Sailors from Helicopter Maritime Strike Squadron (HSM) 37, the Easyriders, rescued three stranded fishermen approximately 140 nautical miles southwest of Kona, Hawaii, March 11 at about 2:30 a.m. (HST). Joint Rescue Coordination Center Hawaii received two Search and Rescue Satellite Aided Tracking (SARSAT) alerts from Emergency Position Indicating Radio Beacons (EPIRB) on board the 41-foot commercial fishing vessel Vicious Cycle and dispatched an MH-60R helicopter from HSM-37, based at Kaneohe Bay, to assist. The Coast Guard also launched an HC-130 Hercules aircrew from Coast Guard Air Station Barbers Point. The Coast Guard Cutter Alex Haley (WMEC 39) and a fishing vessel operating in the vicinity were also diverted to assist. The fishermen were found in a life raft adrift. The HSM-37 aircrew hoisted them aboard the helicopter and transported them to Kalaeloa Airport where they were then taken to Queen's Medical Center for evaluation. HSM-37 is the only helicopter maritime strike squadron in the Middle Pacific (MIDPAC) region and provides a variety of helicopter services to MIDPAC-based combatant ships and submarines in addition to deploying operational detachments. HSM-37 detachments support all Pearl Harbor-based Arleigh Burke-class destroyers and Ticonderoga-class cruisers throughout the Western Pacific and Indian Oceans. The MH-60R's primary missions are surface warfare and anti-submarine warfare prosecution through utilization of AGM-114 Hellfire missiles and MK-46/54 torpedoes. Secondary missions include search and rescue, medical evacuation, vertical replenishment, Naval surface fire support, and communications relay, command, control, communications, and command and control warfare.